Prester John particularly intrigued him. This legendary ruler of a vast and powerful Christian empire in the depths of the African continent had existed in the European mythology for hundreds of years. Historically known as Abyssinia, Ethiopia is Africa's oldest independent country. Apart from a short period during the Second World War when it was occupied by Mussolini's Italy, it is one of only two African countries never to have been colonised. It is the second most populous country in Africa, with a population of over 90 million. The capital city of Addis Ababa is known as the ‘political capital of Africa’, as it is home to the headquarters of the African union, as well as a number of international organisations. Ethiopia was also a founding member of the United Nations. In Birds of Prey, Hal Courtney decides to take his ship north to help the mythical Christian emperor Prester John defend his empire from invasion by the Muslim Arabs. 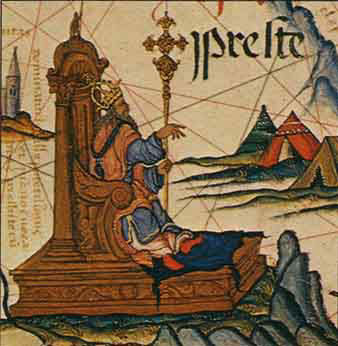 Prester John was a legendary Christian king, allegedly descended from the Magi, the Biblical Three Kings of the Orient. He was said to rule over a vast and wealthy Christian kingdom lost somewhere in the midst of the Muslim nations of the East. In the 12th century, a letter sent to a number of European capitals from an Ethiopian emperor indicated that the kingdom of Prester John was in Africa and this idea took hold. In the 15th century, Portuguese explorers set off for East Africa in search of minerals and natural resources, but they were also hoping to find Prester John so they could use his fabled wealth and power to help convert the Muslims and establish control over the region. When they arrived in Ethiopia, they discovered a mysterious Christian empire, surrounded by Muslim countries. It that had been ruled for centuries by emperors who were apparently descended from King Solomon and the Queen of Sheba. Naturally the Portuguese assumed that they had found Prester John, and from that time on the Emperors of Ethiopia were associated in the minds of Europeans with the mysterious ruler. To add to the allure of Prester John, it was thought that he was in possession of some of the Christian world's most precious icons. One story, widely believed at the time, told of how the Ethiopian emperor Menelik I, when on a visit to Jerusalem, smuggled out of the Temple the Ark of the Covenant, containing the tablets on which the Ten Commandments were written. Menelik brought it back to Aksum in northern Ethiopia, where it was hidden away. It was eventually given a home in the St Mary of Zion Church, a traditional coronation church of Ethiopian emperors. In the 1950s, the Empress Menen, wife of the last Emperor of Ethiopia, Haile Selassie, built a new chapel beside the church, the Chapel of the Tablet, in which to house the Ark. Based on this tale, Axum has been a place of pilgrimage for hundreds of years, but only the chosen guardian monk may enter the chapel and view the Ark. As he is confined to the chapel until he dies, it is difficult to fully authenticate the legend. The Emperors were hereditary rulers of Ethiopia for centuries, maintaining what was described as a 'benevolent autocracy'. They claimed descent from the legendary Menelik I, son of King Solomon and the Queen of Sheba, who ruled around 950 BC. The 225th and last emperor was Haile Selassie, who was deposed in 1974 by Marxist rebels supported by the Soviet Union. The resulting junta was itself overthrown in the 1990s, since when Ethiopia has become a relatively stable democracy.